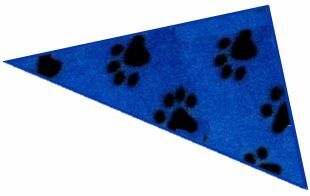 Make ten or more simple dog toys from a yard of fleece (with no stuffing to be pulled out, eaten, or strewn around the room). It seems like every hound loves those faux fleece toys. You know, the ones shaped like little people. The first problem with those is that they can cost $8-$12 each. Yikes! A yard of faux fleece at a fabric store is around $8. With that yard, you can make 10-20 toys, depending upon the shape you choose. The second problem is that the manufacturers put stuffing in them. We have one hound who can remove all stuffing within 30 seconds. What a mess! The hounds have just as much fun with the “gutless” version. For the maximum number of toys per yard and the quickest production time, cut the fleece into 12″ x 20″ rectangles. 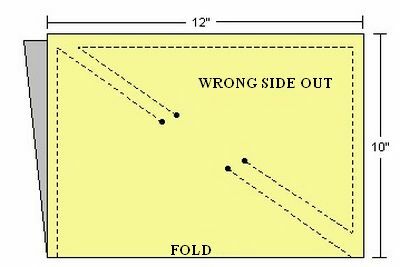 Fold each piece with right sides together and sew as indicated below. Cut between the stitch lines that run diagonally across the piece. Turn right side out and stitch the hole shut. The hounds are happy with the triangles. However, sometimes you want something special, perhaps as a gift. I’ve done hearts, initials, bones and gingerbread men. Place two pieces of fleece with right sides together. With a marker or pencil, draw the shape on the wrong side of the fleece (if you’re doing initials, be sure the mirror the letter so it will be correct when you turn it inside out. Stitch along the pencil line, leaving a small hole to turn the toy right side out. Turn right side out and stitch the hole closed. We encourage you to use these patterns to help your local greyhound adoption group. Donate a few to your local group. You’ll feel good about yourself and you’ll be helping the hounds.